Discover Leuven. Saint Michael's Church in the Naamse Straat, Leuven, Belgium. Saint Michael's Church in Leuven, Belgium. Facade of Saint Michael's Church in the Naamse straat, Leuven. Saint Michael's Church is located in the Naamse straat, a few hundred meters from the city center. 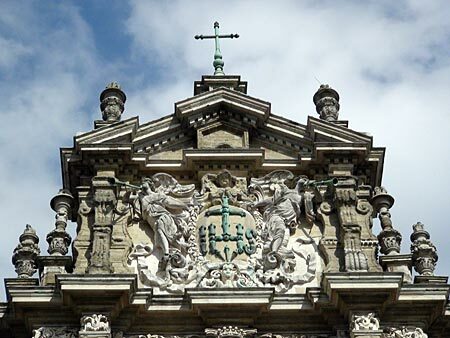 The church was built between 1650 and 1671 for the Jesuit College of Leuven by Jesuit architect Willem Hesius. Initially it was built as a house of prayer for the Jesuit monastery. The Jesuit community was founded in Paris in 1540 by Ignatius de Loyola. Following the Franco-Spanish war the Spanish members of the community were ordered to leave France, and in 1542 seven Spanish Jesuits came to Leuven. When visiting Saint Michael's Church you will often notice Spanish visitors, so I reckon the church is well known and 'promoted' by Spanish travel guides. 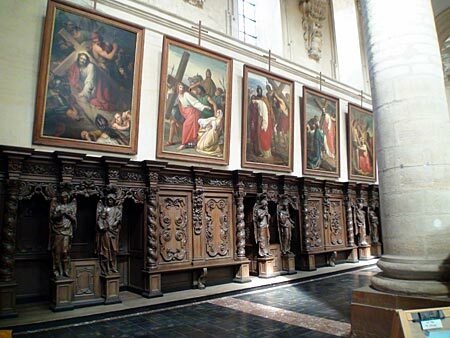 Confessionals and calvary stations at Saint Michael's Church, Leuven. Initially the Jesuits in Leuven lived at various locations in town. Later they built a College (1620-1622), followed by the construction of the church, now known as Saint Michael's Church (1650-1666). The church was built in what is now referred to as 'Jesuit style', inspiration being drawn from the 'Il Jesu' Baroque Church in Rome. A planned dome was never completed. The church is built in white sandstone and ironstone. The frontal facade, with its Ionic pillars and pilasters, friezes decorated with angels, bunches of grapes, ears of corn, etc., has the appearance of an altar. The facade is known as "the altar outside the church'. Saint Michael's Church is a triple-nave church with Ionic columns, Corinthian pilasters and cross-ribbed arching. lnside the porch is a nerthex. 10-11 May 1944. Luckily the frontal facade remained undamaged. Rebuilding of the church was completed in 1950. 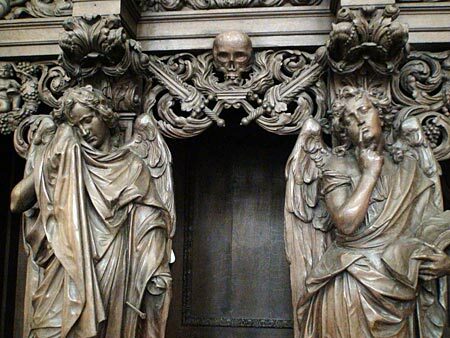 Detail of decorations at confessional boxes, Saint Michael's Church, Leuven.. In the church there are many wooden statues of Christ, Our Lady with child and various saints. The paintings of the calvary stations date from the early and mid 19th century, by different Flemish painters. Several valuable works of art, both statues and paintings, have been given to the Municipal Museum of Leuven for safe keeping. Top of frontal facade of Saint Michael's Church. Source : Abbreviated from leaflets provided in the church (in various languages).